I Medici - The Medicis - FLORENCE LIVE! Despite the external difficulties and political instability, the middle class in Florence did still manage, even in this turbulent period, to maintain -and indeed improve - its standard of living, and to continue the beautification of the city. 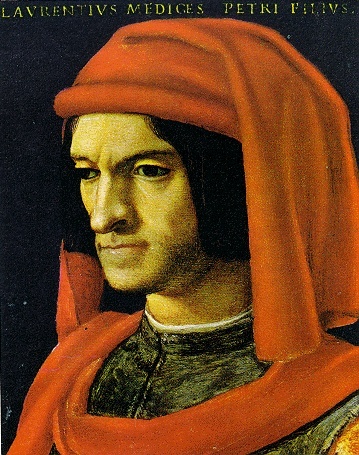 When the Medicis, a successful family of bankers and merchants, came to power in the city in the year 1434, with Cosimo il Vecchio (the Elder), there began a period of cultural flowering which reached its zenith under Cosimo's grandson Lorenzo the Magnificent, in an era known as the Florence Renaissance. Names such as Sandro Botticelli, Domenico Ghirlandaio, Leonardo da Vinci and Michelangelo Buonarroti come to mind when one thinks of this epoch, which was also the acme of Florence's political power in Italy. Rivalry among other patrician families came to a head with the Pazzi Conspiracy in the Cathedral on April 26, 1475, in the course of which Lorenzo's brother Giuliano was killed. Even though this attempt to overthrow Medici rule failed, Florence ultimately relinquished its leading position in the arts to Rome. The inflammatory machinations of the puritanical monk Girolamo Savonarola, who condemned the immoral ways of the Renaissance aristocrats, ultimately led to the Medicis' expulsion from Florence. Savonarola prepared a new republican constitution which remained in effect until 1512. But his sermons against the increasing secularization of the Church attracted the wrath of Pope Alexander VI, and he was burned at the stake in 1498 on the Piazza della Signoria. 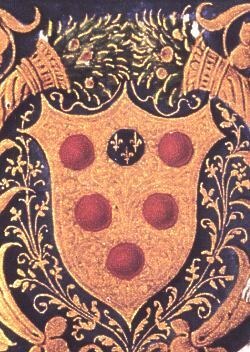 The Medicis returned to power in 1512, and several members of the family became popes during the course of the century. Wealth, power and education were at this time in the hands of the aristocracy, who built majestic palaces for themselves and commissioned great works of art. Many other Renaissance masterpieces were also commissioned by the guilds, including Brunelleschi's dome atop the Cathedral. In 1530, Alessandro de' Medici was appointed Grand Duke of Tuscany by Emperor Charles V, and Florence and Tuscany were to remain under the absolutist control of the Medicis until 1743. When the last member of the dynasty, Gian Gastone, died, the duchy was transferred to Francis I of Lorraine, the husband of Empress Maria Theresa of Austria. The Habsburg-Lorraines governed Tuscany until 1859 - with a fifteenyear interruption between 1799 and 1814, when the French, Napoleon's sister Elisa among them, ruled Florence and held court in the city. In 1859, Grand Duke Leopold II was expelled from Florence, and in 1860 Tuscany relinquished its century-old independence in favor of a unified Italy. Florence was the capital of the Kingdom of Italy from 1865 to 1870, until Victor Emmanuel II moved to Rome.